Groundwater is the main source of water in the semi-arid Calera watershed, located in the State of Zacatecas, Mexico. 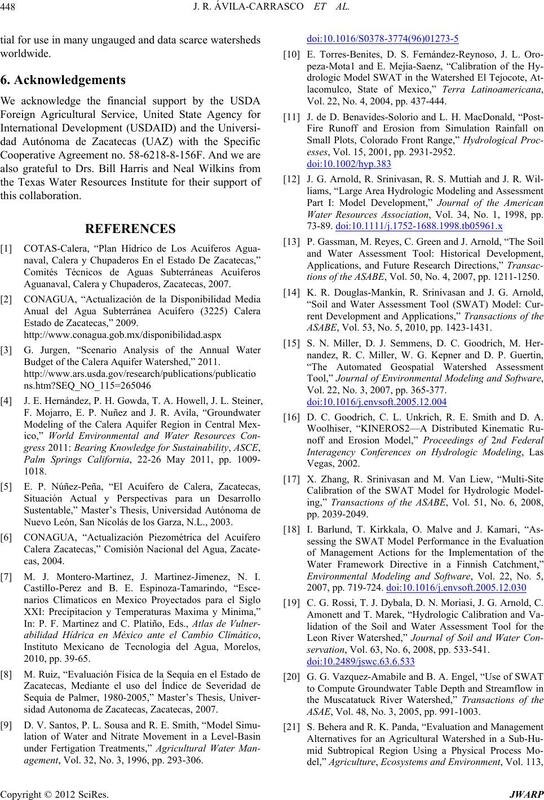 J. R. ÁVILA-CARRASCO ET AL. seolus vulgaris), and livestock fodder. 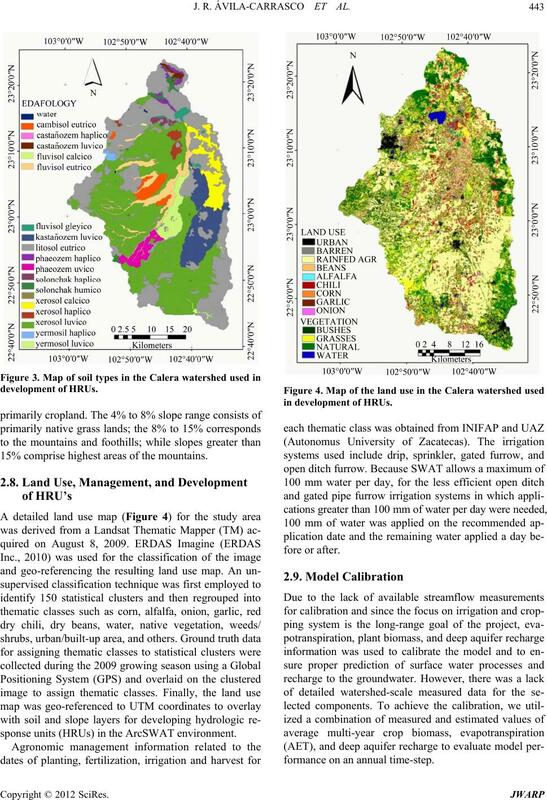 of areas where water has been over-exploited, . ter use policy and decision makers. parameters, and Miller et al. and Goodrich et al. tions as close as possible to observed values. Behera and Panda ; Bosch et al. : Cheng et al. nites, et al. ; and Srinivasan et al., . gies for crop, soil and water management. and recharge by seepage from surface water bodies . temporal scales as stated above. ous (left and right, respectively) to Calera. Figure 1. Calera watershed location and main urban developments. 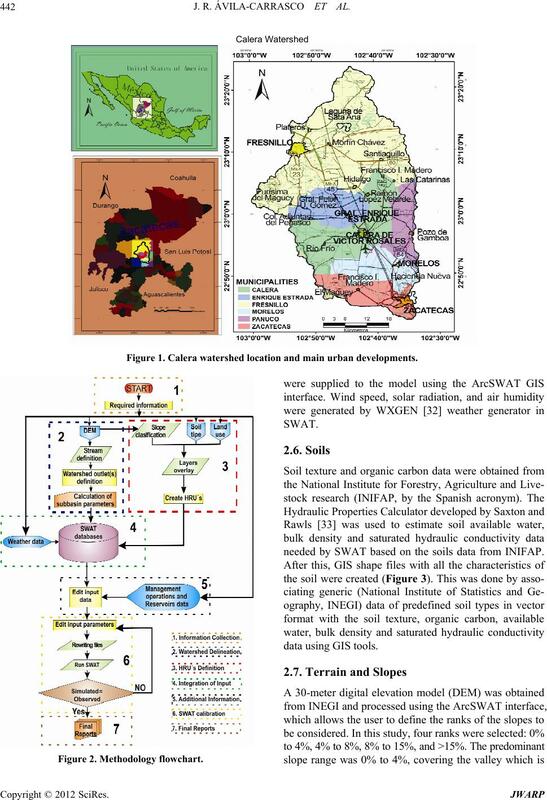 needed by SWAT based on the soils data from INIFAP. 15% comprise highest areas of the mountains. sponse units (HRUs) in the ArcSWAT environment. formance on an annual time-step. irritated area under each system. in proportion to the area under each irrigation system. values and measured mean biomass. pertise on the study area. by the model. PBIAS is calculated with Equation (1). Table 1. 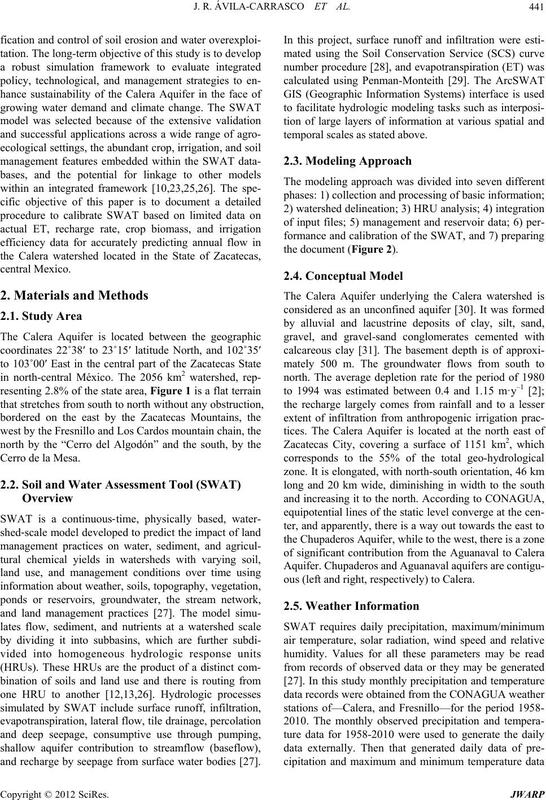 Crop parameters developed for use in the SWAT calibration. curacy of the model in predicting observed values . 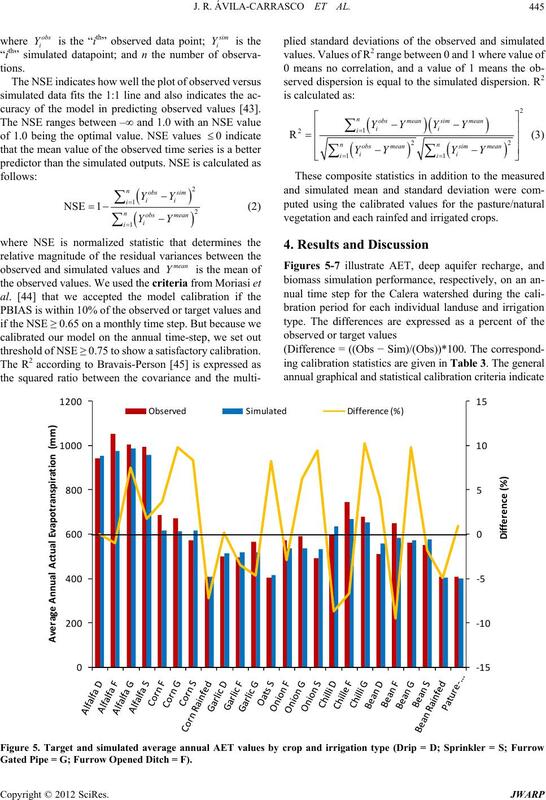 threshold of NSE ≥ 0.75 to show a satisfactory calibration. vegetation and each rainfed and irrigated crops. Gated Pipe = G; Furrow Opened Ditch = F). Furrow Gated Pipe = G; Furrow Opened Ditch = F). Figure 7. Target and simulated average annual bioma ss values by crop and presence or absence of irrigation. biomass well according to Moriasi et al. criteria. 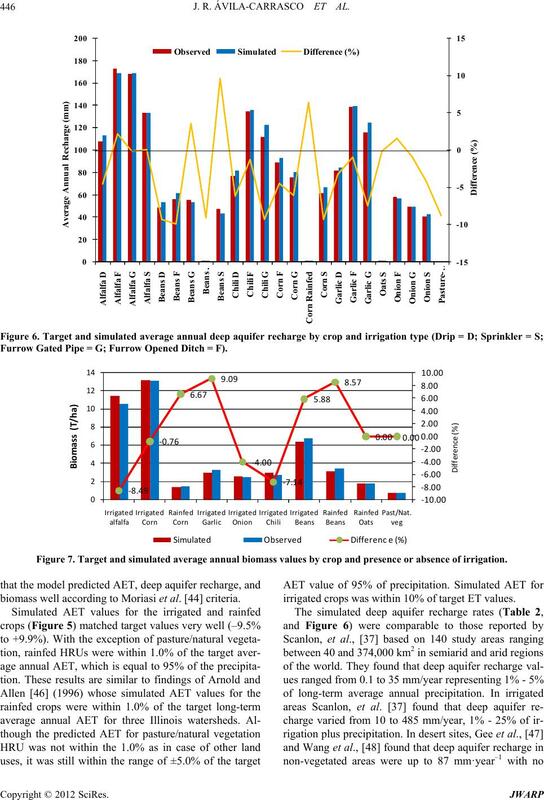 irrigated crops was within 10% of target ET values. mass in the calibration period (1952-2010). the corresponding percent differences for each land use. tractions when more efficient irrigation systems are used. mulated biomass very well, within ±1.0% (Table 2). del adequately simulated crop biomass [10, 21,26]. Table 3. 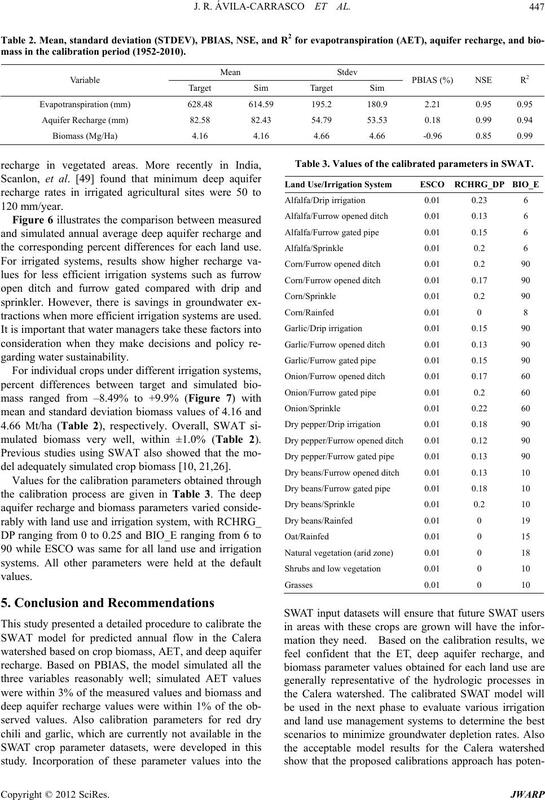 Values of the calibrated parameters in SWAT. Aguanaval, Calera y Chupaderos, Zacatecas, 2007. Budget of the Calera Aquifer Watershed,” 2011. Nuevo León, San Nicolás de los Garza, N.L., 2003. M. J. Montero-Martinez, J. Martinez-Jimenez, N. I.
sidad Autonoma de Zacatecas, Zacatecas, 2007.
agement, Vol. 32, No. 3, 1996, pp. 293-306. Vol. 22, No. 4, 2004, pp. 437-444.
esses, Vol. 15, 2001, pp. 2931-2952. 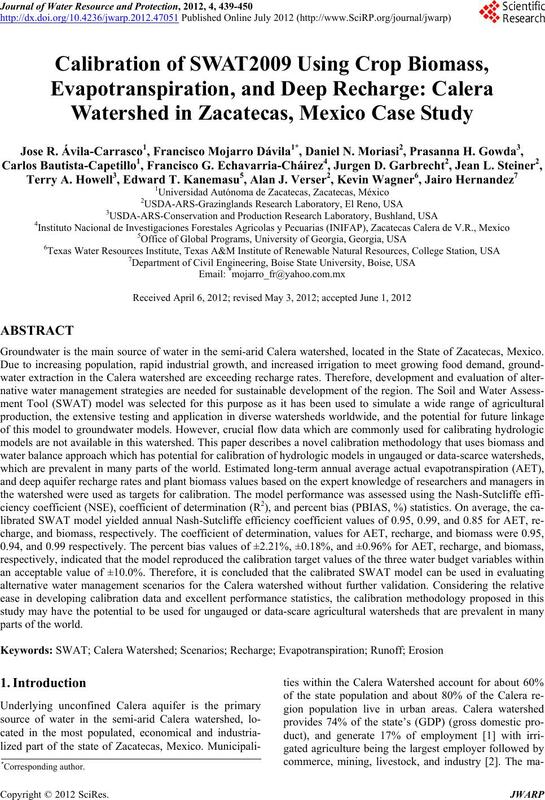 Water Resources Association, Vol. 34, No. 1, 1998, pp. tions of the ASABE, Vol. 50, No. 4, 2007, pp. 1211-1250. ASABE, Vol. 53, No. 5, 2010, pp. 1423-1431. Vol. 22, No. 3, 2007, pp. 365-377. D. C. Goodrich, C. L. Unkrich, R. E. Smith and D. A.
 C. G. Rossi, T. J. Dybala, D. N. Moriasi, J. G. Arnold, C.
servation, Vol. 63, No. 6, 2008, pp. 533-541. ASAE, Vol. 48, No. 3, 2005, pp. 991-1003. No. 1-4, 2006, pp. 62-72. Agricultural Watershed,” Transactions of the ASAE, Vol. 47, No. 5, 2004, pp. 1493-1506. No. 3, 2007, pp. 213-221. No. 3, 2005, pp. 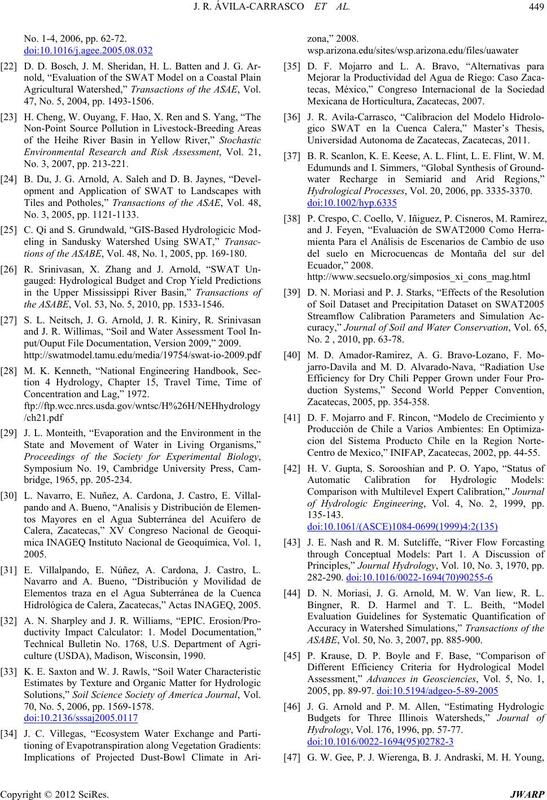 1121-1133.
tions of the ASABE, Vol. 48, No. 1, 2005, pp. 169-180.
the ASABE, Vol. 53, No. 5, 2010, pp. 1533-1546.
put/Ouput File Documentation, Version 2009,” 2009. E. Villalpando, E. Núñez, A. Cardona, J. Castro, L.
Hidrológica de Calera, Zacatecas,” Actas INAGEQ, 2005.
culture (USDA), Madison, Wisconsin, 1990. 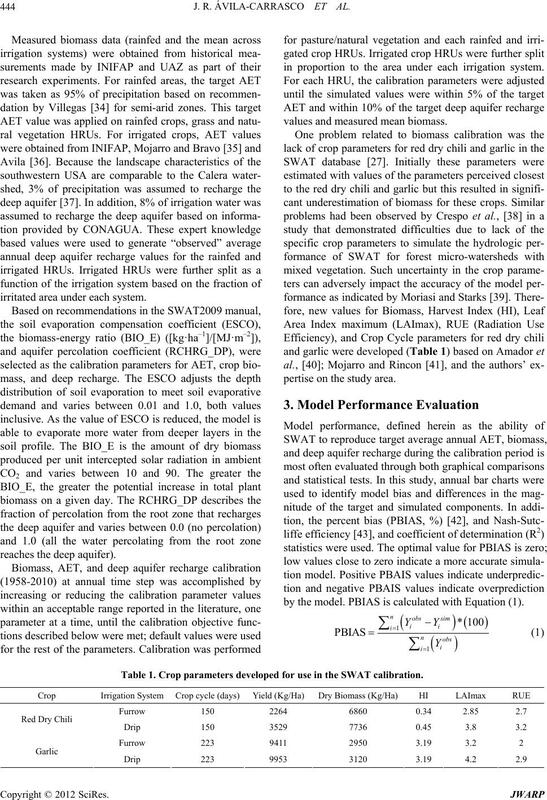 Solutions,” Soil Science Society of America Journal, Vol. 70, No. 5, 2006, pp. 1569-1578. Mexicana de Horticultura, Zacatecas, 2007. Universidad Autonoma de Zacatecas, Zacatecas, 2011. 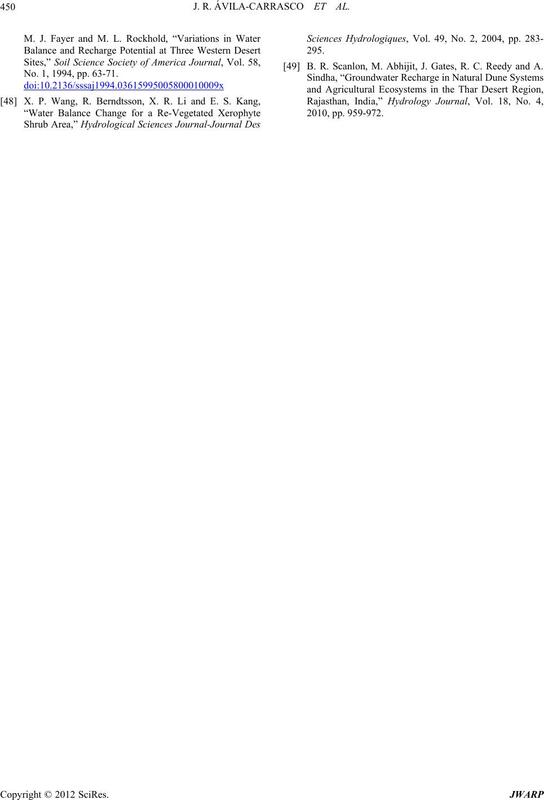 B. R. Scanlon, K. E. Keese, A. L. Flint, L. E. Flint, W. M.
Hydrological Processes, Vol. 20, 2006, pp. 3335-3370. No. 2 , 2010, pp. 63-78. Centro de Mexico,” INIFAP, Zacatecas, 2002, pp. 44-55.
of Hydrologic Engineering, Vol. 4, No. 2, 1999, pp. 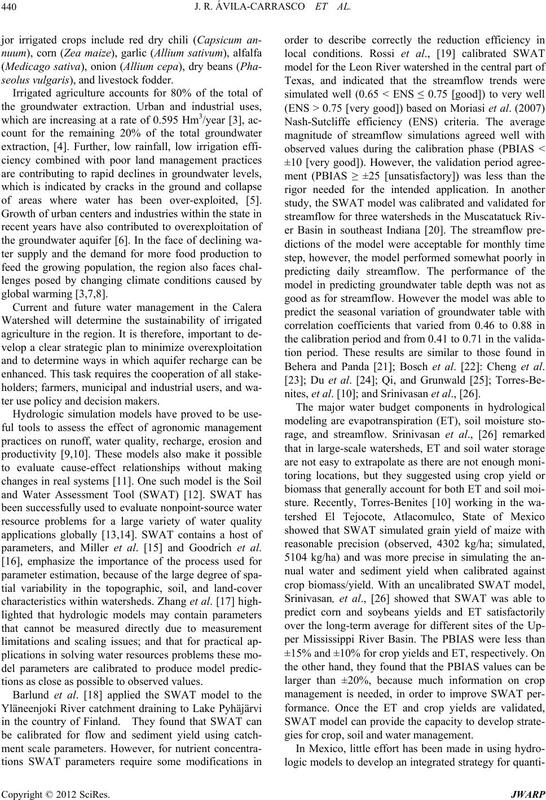 Principles,” Journal Hydrology, Vol. 10, No. 3, 1970, pp. D. N. Moriasi, J. G. Arnold, M. W. Van liew, R. L.
ASABE, Vol. 50, No. 3, 2007, pp. 885-900. Assessment,” Advances in Geosciencies, Vol. ty of America Journal, Vol. No. 1, 1994, pp. 63-71. B. R. Scanlon, M. Abhijit, J. Gates, R. C. Reedy and A.